March 17, 2016, 3:51 p.m. The public radio giant is letting its present impose a strategy tax on its future. By Joshua Benton @jbenton March 17, 2016, 3:51 p.m.
NPR is — sort of like the Associated Press and the major broadcast networks — a creature of its structure. 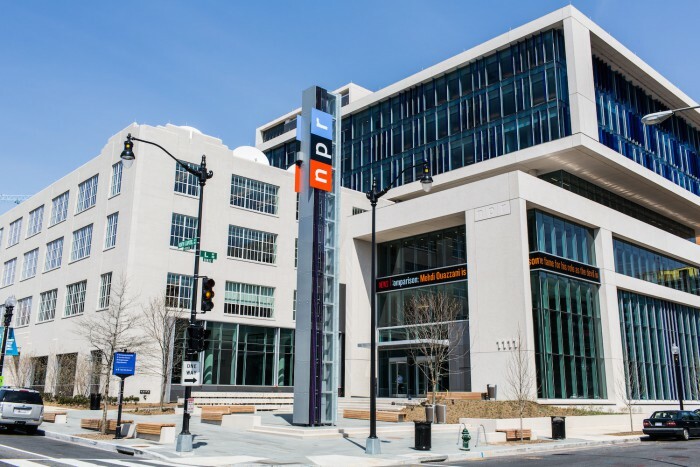 NPR is an entity based in Washington, D.C.; “public radio” includes it, but also other radio distributors like PRI, APM, and PRX and, most importantly, the over 900 NPR member stations that dot the landscape. And these players don’t always have the same interests. A local station’s greatest asset is its connection to the local community, symbolized by the broadcast tower that, uniquely, lets it reach radio listeners in cars and homes. NPR’s greatest asset is the value its audience sees in its content and brand, which might be delivered via a radio signal, a website, a mobile app, or a podcast. As podcasts grow in number and popularity we are talking about them more often in our news programs. We are also fielding more and more questions from news staff and Member stations about our policies for referring to podcasts on air. To that end, we want to establish some common standards, especially for language in back announces. Our hope is to establish basic principles that are easy to understand and allow plenty of flexibility for creativity. These guidelines apply to all podcasts, whether produced by NPR or by other entities. — No Call to Action: We won’t tell people to actively download a podcast or where to find them. No mentions of npr.org, iTunes, Stitcher, NPR One, etc. “That’s Linda Holmes of NPR’s Pop Culture Happy Hour podcast and our blogger on the same subject and Bob Mondello, NPR’s film critic. Thanks so much. “OK, everyone. You can download Alt.Latino from iTunes and, of course, via the NPR One app. — Informational, not Promotional: When referring to podcasts, and the people who host, produce, or contribute to them, we will mention the name of the podcast but not in a way that explicitly endorses it. References should not specifically promote the content of the podcast (e.g., “This week, the Politics Podcast team digs into delegate math.”) If you feel a podcast title needs explaining (e.g. Hidden Brain), some additional language can be added (e.g., “That’s Shankar Vedantam, he hosts a podcast that explores the unseen patterns of human behavior. It’s called, Hidden Brain”). Just to repeat: Be creative in how you back announce podcasts, but please avoid outright promotion. — No NPR One: For now, NPR One will not be promoted on the air. In other words, NPR can’t promote NPR One — the lauded, loved app that is basically the future of NPR — to what is literally the group of people that would be most interested in it, NPR radio listeners. NPR is investing substantially in developing podcasts — but it isn’t allowed to tell radio listeners where to find them or how they can listen to them. I know why, but still, wow. so we can say, 'we have a podcast!' but provide ZERO direction or call to action? First off: Let’s hope that it was just some sort of bad CMS choice that caused this new policy to be published as part of the NPR Ethics Handbook. This is not in any way about ethics; whether or not to promote podcasts is not a question of journalism standards. What it is about is the business structure of public radio. Stations hate the idea of listeners trading in their local loyalty for a direct-from-NPR experience. Of those 900 or so member stations, there are maybe a few dozen who generate really significant local content. Most are just vectors for the distribution of Morning Edition, All Things Considered, Car Talk, This American Life, and so on. (This conflict is why “NPR CEO” is one of the hardest jobs in media and has been for a decade or so now.) NPR One goes out of its way to encourage localization and bring in local station content and branding. The most optimistic way to look at this is that a radio listener is more valuable to NPR on average than a digital listener, and NPR does not want to encourage anyone to convert from Group A to Group B. This calculus is no doubt true, today, in 2016. But it was also true, in earlier days of the web (and still today! ), that a print newspaper reader is more valuable than a digital newspaper reader. I remember heated debates in the late 1990s and early 2000s about whether or not newspapers should mention or promote their websites in print. I think that approach is shortsighted — as it turns out, people found out about the web even without newspapers printing URLs in 2002! — but at least there’s a certain internal logic to it. A strategy tax is anything that makes a product less likely to succeed, yet is included to further larger corporate goals. The classic example is Steve Ballmer-era Microsoft, where lots of unusual product decisions were made because Nothing Could Be Done That Might Weaken Microsoft Windows. The platforms that are pretty clearly NPR’s future — NPR One and podcasts — are in conflict with NPR’s present — broadcast distribution and local station structure. NPR is letting the present act as a strategy tax on the future. Look, the impact of this “ethics” policy is going to be small. The number of people who want to listen to podcasts but won’t figure out how to download one without Steve Inskeep walking them through the process is tiny. There are plenty of ways NPR One can be effectively marketed through digital channels. But the issue here isn’t the impact of the policy — it’s what it tells us about NPR’s underlying strategy. Again, I have enormous sympathy for the people making these decisions at NPR — just as I had enormous sympathy for those working through an analogous set of questions at newspapers 5 or 10 years ago. But if you see a future, at a certain point you’ve got to commit to getting there. POSTED March 17, 2016, 3:51 p.m.
Benton, Joshua. "NPR decides it won’t promote its podcasts or NPR One on air." Nieman Journalism Lab. Nieman Foundation for Journalism at Harvard, 17 Mar. 2016. Web. 18 Apr. 2019. Benton, Joshua. "NPR decides it won’t promote its podcasts or NPR One on air." Nieman Journalism Lab. Last modified March 17, 2016. Accessed April 18, 2019. https://www.niemanlab.org/2016/03/npr-decides-it-wont-promote-its-podcasts-or-npr-one-on-air/.